A bit after 14.00 we arrived in Yung Dao. Trudy told us that Wun Bin would meet us at the Kentucky Fried Chicken(!!) at 15.00 – that gave us more than enough time to wander through West Street where all the tourist shops are. I looked at a rather nice silver teaspoon but decided that €200,00 was more than I wanted to pay (it was priced by weight so not much leeway for negotiation). Wun Bin and a driver who did not speak English met us at KFC and took us to the Yulong River (Dragon Meeting River) where we were taken on a bamboo raft from the Golden Dragon bridge which is supposed to be 400 years old. It is the biggest branch of Li River in Yangshuo county. 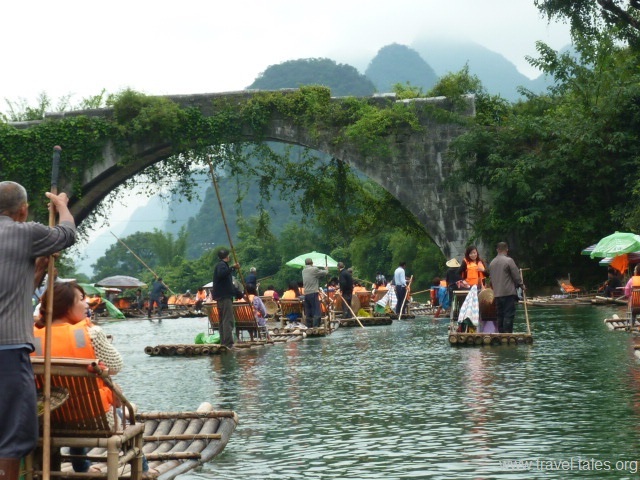 Apart from the incredible landscape that rivals Li River, Yulong River owns its special more peaceful and vivid scenery with ancient villages and bridges along with daily life scenes of local people. There we saw a cormorant fisherman fishing. The cormorant dived in the water, came up with a fish in its beak which it promptly swallowed but came back to the fisherman who held the bird and stroked the throat so that the fish was regurgitated. That was done twice. We had a front row view of it and in no time the river was full of the rafts and everyone else had a good view too. We were not sure if it was good luck or good management. We then went the other way up the river going down two weirs which meant a bit of splashing. Then our boatman – or punter went to a particular spot and collected a card from someone with a very lazy job – just sitting in a chair doling out these cards! Also along the way there were a few buffalo, then back again to the village.